Resort Diving Courses, 2 Tank Dive Trip, Shark AdventureTM and many more -- for all skill levels. Diving Tours starting from US$78 per person. Total immersion is the best way to appreciate the remarkable sea life and reef formations of The Bahamas; the drop-offs close to shore and currents that wash the water gin-clear make these islands a diver's dream. Like sailing, scuba diving requires a little bit of skill but is well worth the effort. Learning to dive is an experience unto itself, but after you know how, you'll see (and, if you're brave, touch) creatures you could never meet any other way. 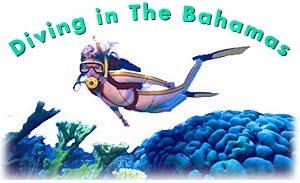 Local dive operators offer guided dives, classes, and supply equipment for unguided dives all over The Bahamas. Swim with the sharks in guided and safe shark dives. Explore sunken wrecks from the pirate days, or dive at night, when the nocturnal fauna emerge. Dolphin dives offer a unique way to encounter these friendly and intelligent mammals without penning them up in the process. Marine biologists in the Exumas guide eco-dives for small groups who want to learn more about the coral reef habitat and its surrounding waters. When you leave you'll know and appreciate these waters as much more than a mere backdrop to The Bahamas' fine beaches. The Bahamas are known for their blue holes, extraordinarily deep inland sea pools fed by the ocean via natural underground passages. These breathtaking pools, caves, and tunnels offer endless discovery and challenge for even the most experienced diver. Caution should be exercised when exploring the blue holes, as they can become dangerous vortices when the tides are strong. The safest way for most to enjoy the blue holes is from the surface--they can be up to 200 feet across, and appear like apparitions in the landscape. The waters of The Bahamas yield incredible 100-foot visibility, coral that grows a bit larger and marine life that is slightly more abundant than elsewhere in the already-teeming Caribbean Sea. Coral formations reveal their hypnotic shapes and colors, from fantastic coral canyons to delicate scarlet fans and latticework. The diving tends to improve the farther one goes into the Out Islands, and Andros is a particularly fine dive destination. Off the coast of the Abacos and Eleuthera, there are not only shipwrecks but also the rarest of undersea ruins--train wrecks.